Multiple Kernel Learning (MKL) suffers from slow learning speed and poor generalization ability. Existing methods seldom address these problems well simultaneously. 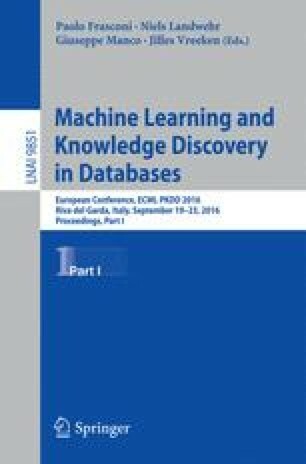 In this paper, by defining a multiclass (pseudo-) likelihood function that accounts for the margin loss for kernelized classification, we develop a robust Bayesian maximum margin MKL framework with Dirichlet and the three parameter Beta normal priors imposed on the kernel and sample combination weights respectively. For inference, we exploit the data augmentation idea and devise an efficient MCMC algorithm in the augmented variable space, employing the Riemann manifold Hamiltonian Monte Carlo technique to sample from the conditional posterior of kernel weights, and making use of local conjugacy for all other variables. Such geometry and conjugacy based posterior sampling leads to very fast mixing rate and scales linearly with the number of kernels used. Extensive experiments on classification tasks validate the superiority of the proposed method in both efficacy and efficiency. This work was supported by the National Natural Science Foundation of China (No. 61473273, 61573335, 91546122, 61303059), Guangdong provincial science and technology plan projects (No. 2015B010109005), and the Science and Technology Funds of Guiyang (No. 201410012).